Fact 1: Australian soils are old and not necessarily fertile. We see what is left of the the rainforests where I live in sub-tropical Australia with the incredible mass of vegetation that they support, and think wow – just think what I could grow on that soil! The trouble is, the fertility is all in the canopy. Once you remove the natural vegetation, and inherent recycling of nutrients, the soils quickly become depleted and acidic because of the high rainfall and leaching – the good stuff is simple washed away. Fact 2: What makes our soils acid (sour)? The alkaline elements in the soil are more soluble in water than the acid ones. Think about how stalagmites are formed – alkaline calcium carbonate, dissolved in water, is slowly being deposited on the floor of a cave, drip by drip, – that is why tropical soils quickly acidify – the acid elements of the soil are held, while the alkaline – washed away. The Amazon story – it’s a sorry one. Hectare after hectare was cleared to run beef cattle (mostly for the American hamburger market) thinking they had found Bonanza! Very quickly they discovered that the soils, that had previously supported a verdant and incredibly diverse rainforest, couldn’t even grow grass without massive chemical input. Fact 3: Australia, the old soil story. Most volcanic soils elsewhere in the world are incredibly fertile, but they are so old in Australia (last major volcanic activity more than 5,000 years ago), that if the vegetation is cleared above them they quickly become very acid and infertile. 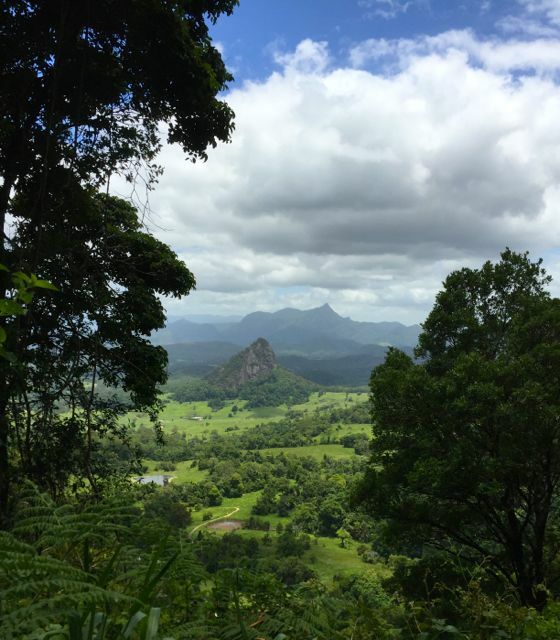 Volcanic plugs of Wollumbin (Mt. Warning) and Doughboy, part of one of the largest caldera’s in the world. All that is left of the Tweed Volcano that last erupted 25 million years ago. Now, take a look at Indonesia where the volcanic activity is recent – in fact currently very active. 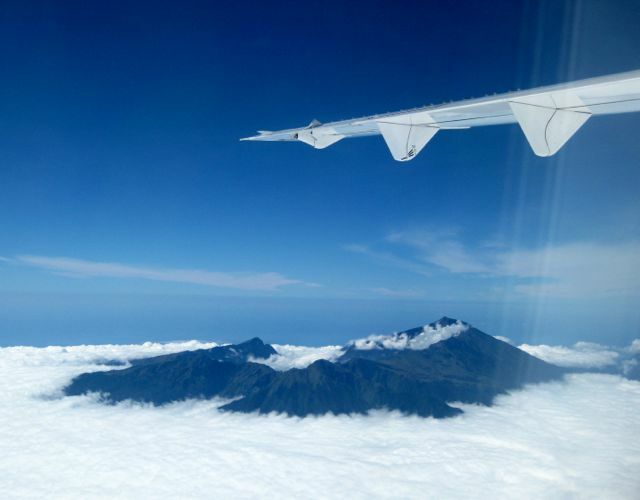 It’s amazing to fly over the islands of our closest neighbour and see more than 100 active volcanoes puffing away above the cloud-line – a sight to behold, and this is why Java is able to support one of the densest populations in the world – its soils have constantly been replenished by its volcanoes. The trouble in many parts of Indonesia today today, because of population pressures, is that they are running out of space and are trying to grow food crops on what were once rice fields, or cleared rainforest, and you have the same inherent problems – within a couple of seasons soil fertility is lost and your are left with acidity from water leaching, and that’s how we all end up in the same boat – depleted soils. Fact 4: So how do we fix it? Understanding pH – the balance between acidity and alkalinity, will help you be a better gardener. So buy a kit and test your soil. Getting the soil chemistry right is fundamental to growing a healthy garden and remember that food is only as good as the soil it is grown in. DON’T BE AFRAID – this is not rocket science – everyone can do it and it is fun! Doing a pH test of mushroom compost – showing it to be quite alkaline at 9 on the scale of 0-14. Below 7 is acid, above it alkaline. 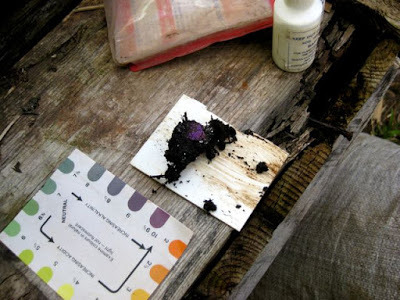 Slightly acidic or neutral soils, with a pH of 6.5-7, is what we are aiming for as this is when most minerals in the soil become chemically available to plants because microbial activity, that releases these nutrients, are at their most active. If the chemistry isn’t right, merely adding extra fertiliser won’t improve plant health, it just wastes money. Think of the nutrients in your soil as being like the treasures locked away in a bank vault and the right pH being the combination that unlocks them. In organic soils these nutrients are mostly there all the time but can be unavailable if the pH is not right. Get smart and get a pH testing kit. 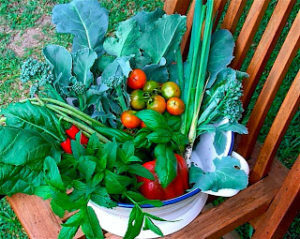 Fact 5: The organic gardener has the upper hand over ‘conventional’ gardeners. Invariably, the continual use of organic mulches and fertilizers will, over time, rectify pH problems without having to do just about anything else. But, what do you do if you want to fix the soil quickly without harming it? Soils too acid- below 5. Add lime or dolomite at a rate of one handful per square metre and rake it in. 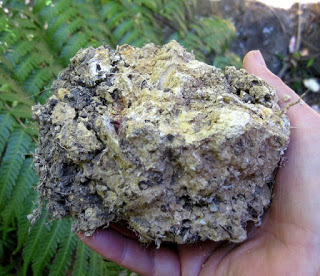 Add mushroom compost – it contains composted chalk (alkaline) and will help to neutralize the soil while adding vital organic matter (see photo above). Soils too alkaline – above 9. Add blood and bone, chicken manure, urine and lots of compost. JUST A THOUGHT! WHY ARE SUBURBAN SOILS OFTEN QUITE ALKALINE? Because the materials used to construct houses, cement, lime, mortar etc., are highly alkaline and run-off into the soil. But you now know what to do about it? The continual addition of organic matter to soil in the tropics will do more, in the long term, to keeping your plants healthy than just about anything else. Composted kitchen scraps, grass clipping, animal manures, aquatic weeds, shredded garden waste, green weeds/straw/tree chippings/mushroom compost/seaweed, shredded newspaper, eggshells, human waste – anything that was once alive. WHY? 1. They add vital nutrients to the soil that are needed by plants in a regular supply – nitrogen, phosphorus, potassium and calcium. 2. Enrich the roil with beneficial micro-organisms. 3. Increases the ‘sponginess’ of the soil i.e. air spaces. 4. Hold all those valuable nutrients in the soil and stop them from washing away in heavy rains. 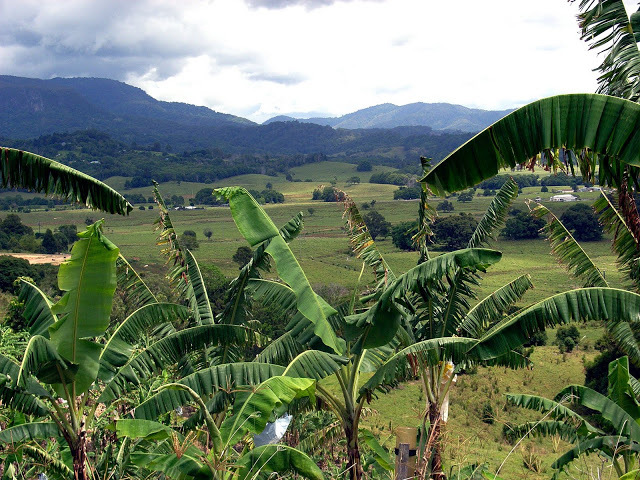 My Country – banana plantations and farm paddocks in the flood plain with the remnants of a once mighty rainforest in the distance. Fact 7: Practical soil tests that everyone can do. Soil scientists have many sophisticated methods for defining soil types – here is a very simple, but useful one that everyone can do. The old bracelet test. 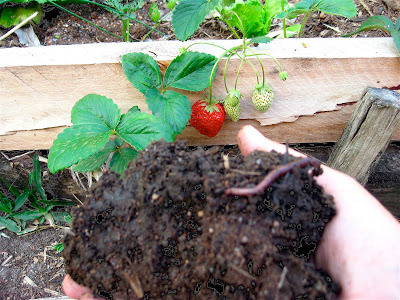 How to tell what type of soil you have and whether it has sufficient organic matter? Get a handful of soil and moisten it. SAND. Try to form it into a ball. If it won’t do that it is SAND, which has perfect DRAINAGE but needs lots or organic matter to make it fertile and stop that water from running away with all those valuable nutrients in it. LOAM. Try forming it into a long strip. 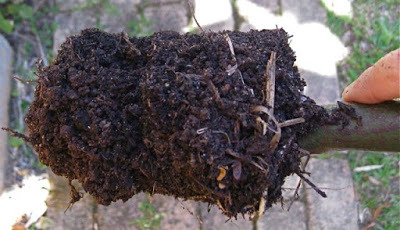 If you can make a short one but then it begins to crack as you bend it – this is a LOAM (usually has plenty of organic matter and will be fertile) – often a mixture of soils often from river flood plains – this is what all of us gardeners hope for. Fact 8: You can make a difference. FACT: It is through the work of these micro-organisms that material in the soil is converted into nutrients that the plant roots can take up – without them your soil would be dead!! The drylands of the world are increasing – they now cover 41% – with their resulting soil infertility Everything that YOU do to improve soil quality MATTERS. The health of the world’s soils hinges on the abundance and diversity of the microbes and fungi they contain, and we are only just beginning to understand the relationship of healthy soils (and healthy people), carbon fixing and climate change. The developers legacy in my garden – beige pudding – solid sub-soil clay. How I learned my lesson about pH. 1. I was running some organic gardening workshops in Indonesia and was approached by some farmers who wanted to rip out their unproductive citrus orchard telling me that it was the fault of ‘bad spirits’. A simple pH test showed the soil to be 4.5 (too acid for citrus) and was very compacted. Following a top dressing of lime and mulching with pupuk sapi (cow poo) and rice straw the problem was fixed and the trees very quickly began to bear fruit again. 2. Fifteen years ago I bought a property in the sub-tropics of northern NSW and swooned at the sight of the 2m deep red earth that looked like crumbly chocolate. I then begun to wonder why nothing really thrived. A quick pH test showed the soil to be 4! – way too acid. The vegetation had been removed many years before with no soil improvement and it needs continual love and care for it to be productive – even today. 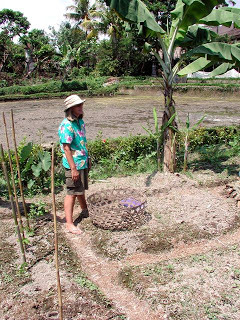 Set with the task of making a productive food garden in Ubud, Bali, from an old rice field it was not that hard to fix the very acid soils and soon start producing fruit and vegetables. 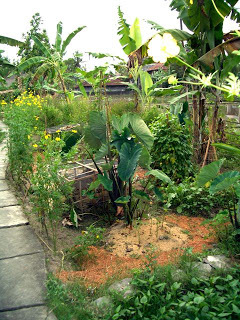 We started with a no-dig bed, edged with spent banana stems, and just kept building up the organic matter. In exchange for produce from the garden, local cow owners and rice farmers were happy to do a swap of produce for their cow poo and rice straw. Fixing the soil is like trying to fix anything else – it just requires common sense, observation and patience (plus the wisdom of the centuries!). Let Nature be your guide.